AN Israeli tourist drowned while swimming without a life jacket in the flooded Zambezi River in Victoria Falls on Sunday. The body of 34-year-old Mr Ofer Cohen who is a holder of a Polish passport was retrieved by a six-member team of sub-aqua unit and rafting guides yesterday. It took the team more than two hours to retrieve the body because water levels have risen significantly making peddling difficult. National police spokesperson Assistant Commissioner Paul Nyathi confirmed the incident and said investigations are in progress. “We’re investigating the circumstances in which a foreign national was found dead in Victoria Falls. More information and details about the deceased will be released soon,” he said. The Chronicle, however, learnt that the deceased is an Israeli national who entered the country late last month on a 30-day visiting visa. Mr Cohen, who was travelling alone on holiday, had booked at Shoestrings Lodge where he stayed for two nights before checking out to stay with some friends Mr Ralf Tathan and Mr Mutsawashe Munkono in Aerodrome suburb. He was last seen on Sunday at around 5PM when he left home driving an X-Trail going for a sunset walk along the Zambezi River. While there, it is suspected that he decided to swim in the river near Rapid Number 1 without a life jacket and was swept away. One of his friends who identified himself as Simon said they started looking for him on Monday after he did not return home. “We set-off looking for him and found the car parked at Rainforest car park while his clothes were on the rocks in the river,” he said. Mr Cohen’s friends reported to police on Tuesday morning after spotting the body in water at the gorges after Rapid Number 4. 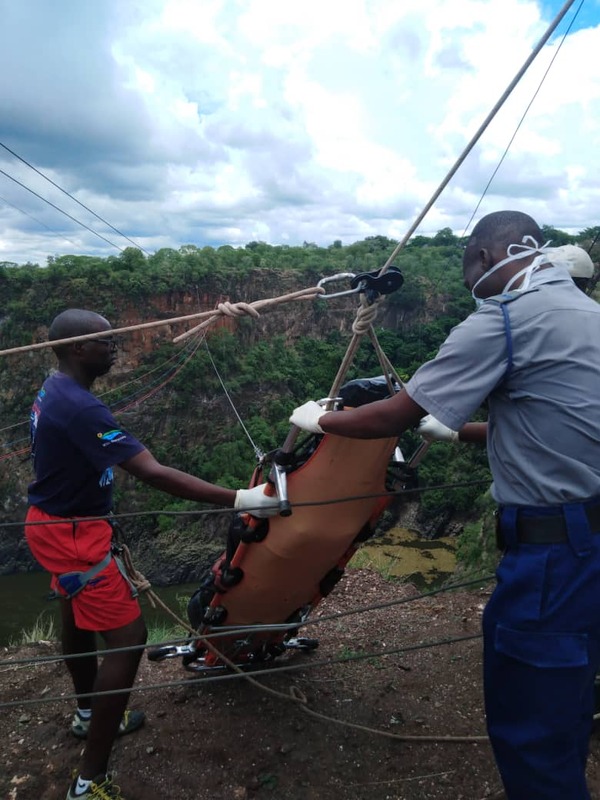 A sub-aqua team was called from Bulawayo and was joined by rafting guides from Shearwater Adventures and Wild Horizons.It took the team more than two hours to reach the body and airlift it using gorge swing. The rescuers tied a rope to the left leg and pulled the body to the edge of the river where it was then lifted using a gorge swing. Rafting guide leader from Wild Horizons Mr Skinner Ndlovu said water levels were rising by an average one centimetre daily hence it was dangerous to enter the water without a life jacket. His counterpart from Shearwater Mr Cephas Moyo said it was difficult to convince the team to go down the gorges due to high water levels.